It’s becoming more and more difficult to run a profitable medical practice. Physicians are under increasing pressure to see more patients daily to make ends meet. Many are looking to telemedicine to accomplish this task without increasing overhead costs. 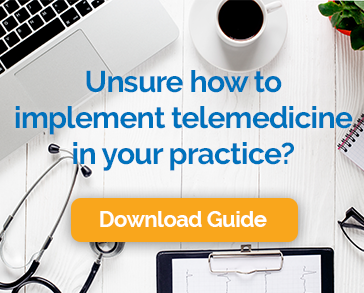 A key factor in successfully implementing a telemedicine program in your practice is to engage current patients and staff about telemedicine. Just think, what if you could increase appointment volume with the patients you already have! Fortunately, Chiron Health helps physicians and their staff promote their practice’s telemedicine program to do just that. Here we review a couple tactics that can be included in your Chiron Health subscription to easily educate and engage patients. Capture patients’ attention while they are already in the office. Whether in the waiting room or exam room, this is a great time to educate patients on all the services your practice provides–including telemedicine. Place pamphlets and posters in spaces that are easily seen by patients. Everyone turns to the internet when looking for suggestions these days: from new restaurants to body shops, and medical care is no different. Be sure your practice’s website and social properties (Facebook, Twitter, and LinkedIn), promote all the convenient healthcare options that your practice offers. You don’t have to become a full-time marketer to accomplish this. Chiron Health provides custom marketing plans to make sure that your website and social channels actively engage patients about telemedicine. If you so choose, Chiron Health offers a more managed marketing solution to clients: Patient web pages. Think of this as a single resource to educate your patients about telemedicine. A detailed web page and marketing plan that gives your patients all the information they need about your practice’s telemedicine program. A few examples of what could be included on this page include: your practice logo, detailed set up instructions for patients, and common appointments most suitable for a video visit. Providing our clients the tools they need to ensure a successful telemedicine program is part of our mission: To help physician practices provide convenient health care access to their patients through secure video visits – and receive full reimbursement. Let us know how we can help your practice achieve its goals.